While I have been on the forum for a little while, I don't know much about it. Here are some questions I have about it. 1. Who are the mods? I know only of Huw and drdavewatford. 2. Is linking a set from Brickset as simple as putting the pound symbol before the set number? 3. What is the point(no pun intended) of the points on your profile? All I know is that 1 like = 1 point. 4. And lastly, can someone please explain the new rule on pictures and memes to me. It's quite confusing. Huw, drdavewatford, captainrex101 are the primary forum moderators. Yes! It's quite a great feature here on the forum. Absolutely nothing. It's a feature of "vanilla", which is the site that hosts this forum. I believe it is to reduce clutter and make the forum look more professional. However, only Huw can really provide the true explanation for it. "We don't want to spoil anyone's fun but we just felt they were getting out of hand and once one gets posted the entire thread from then on descends into childishness and it's off-putting to those who are new to the forum. They may have a place on Facebook but we can do without them here. Thank you all for your understanding." Thank you @samiam391, that just about sums it up. Thanks @samiam391 , just thought of one last question. Is there a way so that I get an email when I get mentioned in a post? I know that I get emails when someone PM's me but is that as far as it goes? Yes, "#" is referred to as a "pound" sign. And the "*" is referred to as the 'star' sign. (Which makes less sense because it's clearly an asterisk Apparently those of us the U.S. don't like to say 'asterisk.') It really has more to do with the phone keypad than anything else. And also remember, there really isn't much discourse with regard to the "£" in the U.S. to cause regular confusion. "#" is also called the "number sign" as well (as in "#2 pencil"), depending on the context. Or occasionally, sometimes it's referred to as "octothorp". According to Wikipedia, it's called "pound" sign because it represents weight in pounds avoirdupois, as in "5# of LEGO bricks". And then C# was made, thus confusing matters even further. Where was this? I thought there must be a discussion on it somewhere but never found it. Anyway just wanted to say well done @Huw for introducing it. I don't know what the general consensus was but I did think the forum was getting too much chaff not enough wheat recently. ^ Thanks I will give it a read and see what the consensus was. Likes and points directly coorolate to your worth as a person. ^ Funnily enough this is how I would have dealt with the recent problem of nonsense on the forum. I would have got rid of likes. Because unlike banning something it would no be authoritarian just to turn likes off. People could still post memes if they like or say sausage for no reason but without likes it would be interesting to see if they did. Likes change the way people post so much and intern change a forum completely. 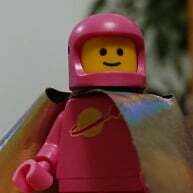 I have found that I post differently on brickset than other forums because of the likes and I am sure other people do to. You make a good point @SMC. I suspect they do have some impact on people posting things just to measure/gain peer approval, and I'd be interested to hear what others think. I would just do away with the 'likes', rather than going back to a +/- system with some of the options above. I think that will invite all sorts of negative energy that does have a way to manifest itself in the current Forum format. Personally, I didn't think there was any crushing need to change anything in the first instance. The point of an open Forum is for people to engage each other. Whether off-topic or not. If the topic gets far enough off-topic, then the participants may chose to go off-forum. I've had many entirely non-Lego conversations with fellow Forum members off-line. I saw it noted elsewhere that Forum 'clutter' was one of the issues. I can say nothing bothers me more than glaring spelling errors in topic threads, repetitive threads, or just odd choices in how a thread topic is posted. I also find it aggravating when a new forum member feels the need to post five new thread topics ten minutes after joining. (When there are similar threads already posted.) Those make the Forum appear 'childish' than memes here and there. Finally, I also saw it noted that certain Forum members gripe about a bunch of off-topic posts as some sort of misnomer that there is 'news' within a topic. I don't think anyone ought to be relying on this Forum as a news source, so such a criticism should be weighed appropriately. A bunch of new posts in a topic thread just indicates that there is a fresh discussion. I'd rather have lots of off-topic discussion than NO on-topic discussion. ^ I agree, the one thing that is difficult to navigate is all the new threads instead of finding an old one and resurecting it. News comes on the main site for me, the forum is to discuss opinions or banter with people who have the same interest. I saw someone saying they didn't like there weren't many comments on the new sets that got released, but then a lot of these comments get put on the main site. If I've said something there I usually won't go and say it over here too. I think the whole 'like' thing is inherent to the internet (comments on The Guardian, Facebook,...). There's nothing wrong with being funny once in a while and the light-heartedness of the posts on this forum is for me what makes Brickset a great place to be. Yes, we all like Lego and like talking about it, but I especially love the community spirit of members helping each other out and that we make each other laugh. The world is depressing enough, we need fun and laughter. Totally agree a dislike button would be bad. I don't mind one way or the other getting rid of the 'likes', I'm sure people will still make me laugh. But then I do think for some people out might be a wake-up call if none of their posts ge liked that they are not providing useful or funny posts. On the other hand, like sumo says, one can always just skip the posts from these people too. People like to have a way of saying "yes! I agree with this" on an forum. do away with likes and you will end up with a lot more of people quoting someone's comment followed by "+1" or "this!" Who wants that kind of thread spamming? Having the option of liking a post is good. And, in my opinion, "likes" should still be displayed at the foot of each individual post. Can't see the point in having a "like" totaliser on each member's Profile page though - it certainly contributes to the "sausage/meme" issue. I like having the "like" button, @snowhitie summed that up quite nicely. Definitely would not add in the other reaction buttons, as it makes it way too easy to be negative about a post. Mom said "If you have nothing nice to say, say nothing". I too like the fact that we can of off topic, the example @Bumblepants gives is a good one and a lot of interesting things come from off topic posts. But maybe we could do with a bit more moderating, not telling people off but when a off topic conversation gets big enough maybe a mod should move it into its own topic. For example how are people meant to know there is a conversation going on about the use of likes. It might be good if a new topic was made and the conversation moved. I know this would be a lot more work for mods but we could have a few more and rather than kill conversations it would add to them by making more people aware they were happening (we need to remember not everyone reads the whole forum). But saying this I have found myself posting less on the forum because I see an interesting post that I want to respond to but the conversion has already moved off in a silly direction and sometime I don't post because it seems people don't want to talk about Lego here anymore. Another problem with likes is they can be used as dislikes, someone will respond to a comment in a very negative way and get lots of likes which is the same as disliking the original comment, in fact it can feel a lot more personal. I think one thing to be carful of is the brickset forum turning into a out of touch golf course who ask their members if women should be allowed to join and they keep coming back with 60% saying no. Are you asking the wrong people, of course a lot of people like the forum as it is as they are the few who use it. But should we be asking those people who use the main site but not the forum what puts them off using it? ^^^ Didn't think of that point @doughts, indeed if you do away with likes there will be even more comments. I'll change to a 'yes' vote. On the off-topic thing, I think it's an issue on other forums too, I do know that sometimes a separate thread gets started with it. I think some threads almost depend on the off-topic posts for their existence. Oddly, it is those very same threads that probably draw the most ire for those off-topic posts. For example, the UCS Falcon Rumors thread would be a lot less than 548 comments if stripped of all the off-topic posts, but would it be any fun to read? It's not like there won't be a brand new thread started when an official announcement is made. If I want Lego "news", I look on the main site, which usually deals in released information. I keep coming here for the behind-the-scenes, rumor-mongering and general silliness that got me hooked on the site a couple of years ago. I almost never use the like feature anywhere. now, I don't know if it pushes people more to compete for attention, or if it only makes this behaviour much more noticeable by giving more spotlight to those people. Please allow myself to correct... myself. I get the sense we are looking for a solution to a problem that doesn't really exist. SMC said: But should we be asking those people who use the main site but not the forum what puts them off using it? I rarely (never?) post in the comments on the main site. Do you want to ask me why I am put off from using it? Better question - why does it matter? I tagged you because you appear to be very interested in the management of the Forum. It surprises me that despite your efforts to 'EuroBrick' this Forum, you're now critical of the hands-off moderation. Which is monumentally ironic in that the mods banned you on EuroBricks. I can't quite reconcile how exactly you think this Forum should be managed. Maybe we can think ahead so we don't feel the need to have this same conversation in six months concerning "+1" and "this!" posts clogging up the Forum. Let's ban these posts now. I've solved an anticipatory problem resultant from a solution to a problem that really didn't exist. Yay! Nobody should have to worry about consequences for posting their thoughts that - in the opinion of a few or one - may be 'off-topic.' Go to EuroBricks for that treatment. The Lego 'Status' Thread is literally a topic-less thread. It's random individual thoughts on their favorite hobby. I don't understand why staying on-topic is apparently more important than whether there is engagement in the Forum. Sermon over. I think everyone already knows my position. Oh, and I would like permission 'Garden.Curation.Manage', just so I can put it on my business card. In what way have I been critical of the moderation? I think the moderation is great, first class. I ignored this earlier, but I find it offensive to compare the Forum to some sort paternalistic sexist outmoded golf course. This is clearly a criticism as to how the Forum is managed. And I'm not going to belabor the point that you have little regard for the moderators anyway. As I noted in a different discussion, if there is some sort of data indicating that memes and video links are a cause of new users (or existing users) retreating or frustrating their participation in the Forum, I would have no problem eating my hat. The bottom line is that @Huw can make changes at his discretion as he sees fit. I would rather have a moderator willing to weigh the options and take the conscientious and cautious approach. Whether or not I personally agree with him. I will leave you with the quote of a man much wiser than me. And he also happens to be a moderator. You've taken this topic off-topic! ^ It was a cheeky comment by @drdavewatford and a bit pointed and at the time I was offended by it because it felt like an attack. Why did it feel like this, because of the number of likes it got. Take away the likes and the post reads a little differently, a bit more jokey and a little less mean. So this is one of the reasons I would remove likes. My comment about the golf club was aimed at the members not the staff. The brickset forum is small, it is connected to a much more used site so I think its fair to ask why more people don't make their way from the main site to the forum. Asking on the forum 'do you want change' will most likely get you the response no, but it is also worth thinking about the people that don't use the site. That was the point I was trying to make. The forum is moderated well, I used to think it wasn't moderated at all but then I stared to notice how quickly @Huw responded when a sensible question was asked and I realised that the site is read but it is an active choice not to intervene much. I appreciate the light touch and its the main reason I use the forum. 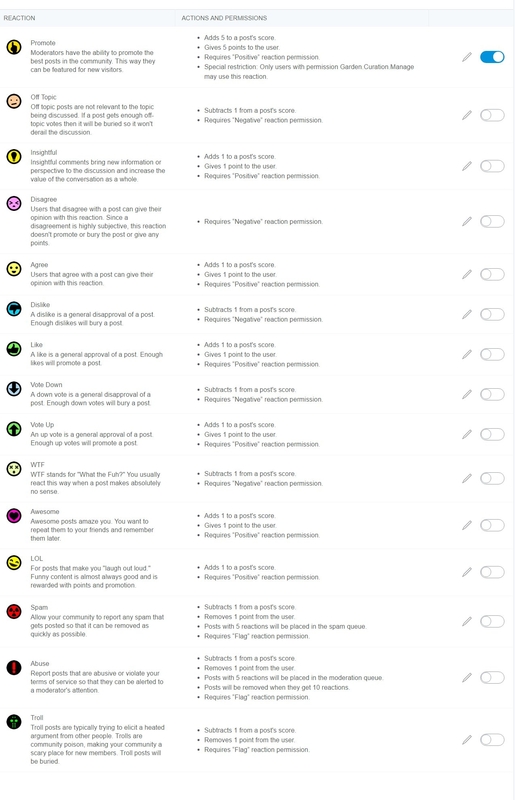 I have PMed the mods a couple of times with problems and they have always been sorted. They are a good bunch of lads and the forum is lucky to have them. Because the main site seems to be aimed at bringing the most number of people in I always assumed that the forum would be the same and this is where I have misunderstood the forum. So maybe the forum isn't manage in the same way I would but then my goals and Huws goals for the forum would be different. I don't think there is anything wrong in making suggestions, it show engagement. The second problem was the forum has over time become more and more unreadable because of the number of silly comments. I think this has meant some people have stop posting all together and even left. I thought the original thread question was answered in the first two comments. Seriously, what in the world is all of this silly behavior everyone? I think there are much more trivial problems in this world that we could be spending our time on than this tiny, insignificant (and quite frankly petty) stuff that we keep bantering over on a little LEGO forum. Yes, said "little LEGO forum" is near and dear to all of our hearts. For me, it's the only place I have to go to, to be a LEGO nerd with my LEGO friends. It's an incredible place with an amazing amount of diversity, accurately reflected in these types of conversations where we all have differing opinions. We talk about LEGO. We bicker. We laugh. We squabble. To be corny, but also quite truthful... It's a family. The Brickset family. I wouldn't trade it for anything (except a white rangefinder)- the good and the bad. Just like any family I think sometimes it's best to recognize that we won't always get along about everything, and that eventually our goofy squabbles might start leading to more harm than good. Perhaps there will be many that will disagree with me (and if so, just keep right on going), but I think we may have reached that point. 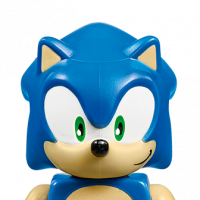 I think it's high time that we move past the enjoyment/disappointment about lost memes, the disagreement/agreements about forum "likes", and other little petty fights that really aren't accomplishing anything other than trying to get under each other's skin... and go back to talking about the little plastic brick that made us a family in the first place. I wouldn't trade it for anything (except a white rangefinder)- the good and the bad. Thank you. This is where I would normally post a YouTube link to Fleetwood Mac - The Chain. I agree. 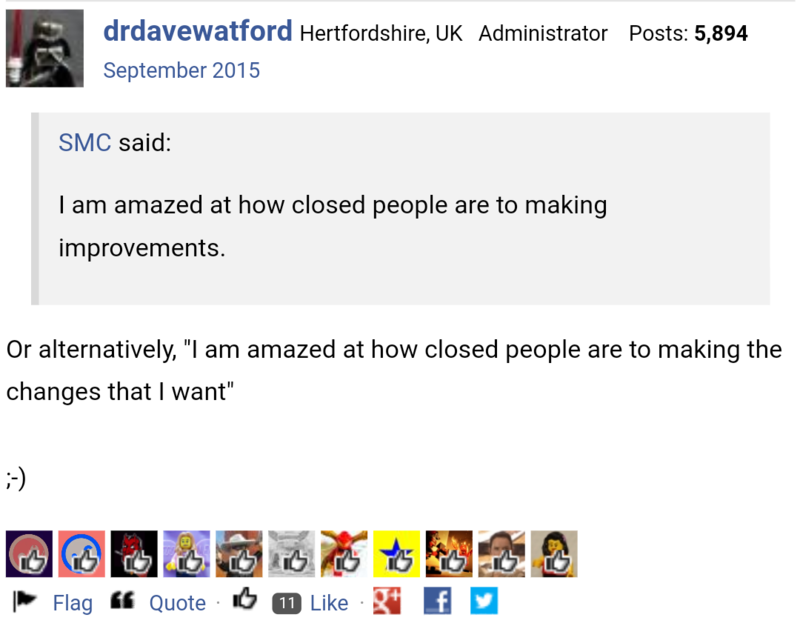 Mods, @huw @drdavewatford @captainrex101, feel free to close this thread whenever you think the right time is. And we just can't leave things be. Am I to assume you posted this because nobody wants to engage in UCS MF discussion/speculation per your suggestion? Or is it a reaction to @prevere or @ccc most recent post? If it's the former - then you need to come to grips with the fact despite your best efforts, the folks in this Forum are not going to do, act, post, or think as you would. If it's the latter - then you need to get a thicker skin. As noted above, there will be instances of interpersonal conflict. It helps to consider the circumstances. Does it really have an effect on your day if someone posts a terse reply? It's probably time to kill this thread off. ^ Neither I was just pointing out that the original problem has not been resolved with the meme ban. Here's another idea - ignore the static and enjoy the posts you find interesting. Let the mods exercise their authority aa they see fit. I get it - this is a "Who has the last word" competition, right? Apparently the last word in The Oxford English Dictionary ends on a nonword, zyxt, a long-obsolete Kentish spelling of second person singular present tense of see! As I have had the last word and it's as obsolete as this (as the questions have been answered )and the Ucs Falcon thread (yes there is a rumour of a new UCS Falcon) can we go back to what we do best and argue about market street, price per piece and lack of aftermarket values these days. (While were at it is there any chance the predictions thread could be re categorized as off topic as that thread seriously needs some humour and most of it is off topic anyway). Why? Memes have been reduced by 1000% over the past week. One gets posted and the problem hasn't been 'resolved'? A bit of an overreaction don't you think? It's been said above and accepted by many that the memes were getting out of hand. Do I think the problem warranted a total ban? No, but if it reduces their numbers down from 1000 to 1 then it's served its purpose. I honestly think we should just leave it the f alone now and allow the mods to do their job. I suspect the forum will soon find its equilibrium with only the limited mod interaction that's made it the success it is. ^ I am meme-free in on-topic non-meme Lego discussions. Gotta roll with your role. I have no desire to change how the Forum is run. I do desire to continue be part of it. Shhh! That's the Shyamalan twist. Because every topic is off-topic, it's open season for memes! Yes, he might have had something to do with it. I'm rather embarrassed for him actually. OK Guys last post about this hopefully, please don't quote me just talk generally about the issues raised. That way it will feel less like an attack on each other and we wont get this back and forth between two people like we saw before. I did not ban memes, I did not suggest they be banned. I did thank Huw in this topic for it because I was please to see the problem had been acknowledged. As the conversation moved onto likes I made the comment that I would have got rid of likes before memes. Huw then said "I'd be interested to hear what others think" so this conversation started. This is the discussion I suspect that was wanted but it got rather lost. It is a choice likes or no likes, why cant we have that discussion? Now the forum, its not a family. Some of you are very close, I get that and its great. Personally I have meet a few of you once and have emailed/PMed a few of you. But at its most basic this is a forum for talking about Lego or have I got that wrong? Now the forum is moderated very lightly and I am an advocate of that approach. People come here to get away from work and stress and so on and don't need someone telling them what to talk about and where to post. And as many of you might have noticed I like an off topic conversation or two. And the discussion is killed, side tracked or worst still the new member who posted originally goes and finds a forum where they will only be told off by the mods not the members. * A ongoing discussion about super Heroes (a massive line with lots of adult interest) and other major themes. * Smaller sub groups talking about trains, tecnic, robots and other geeky things. I could go on but the point is the forum is small, way smaller than it should be when its connected to such a well run and popular site. You are driving people away, your not growing and your very cleeky. I want to talk about Lego and its been a long time since I have been able to do that here! If that is referring to my post about posting wants lists on a thread that has the title "rumours", then doing that is off-topic as it is not a rumour but also confusing as it is the same subject set. If someone wants a specific feature in a UCS MF, then it shouldn't go in a rumours thread as by posting it there, it then becomes a rumour in itself. In that sense, it is more damaging than a silly meme that is easily ignored. That is something that EB moderation actually does well. It stops people adding their wants to rumours threads, and so stops those wants becoming rumours.